The Children's ABC of Road Safety (A.W. Dean). Homepage. This page: A book that describes some of the dangers of the road, to younger people. A book on road safety from the 1930s/1940s. Keeping kids safe on the roads, then as now, can be something of a battle. I remember taking part in Cycling Proficiency lessons after school in the 1970s, while on television the Green Cross Code man instilled fear in any child plotting to venture away from the kerb. Honourable mention also goes to Tufty, a character dreamt up by RoSPA who featured, and continues to feature, in many of their own safety campaigns. 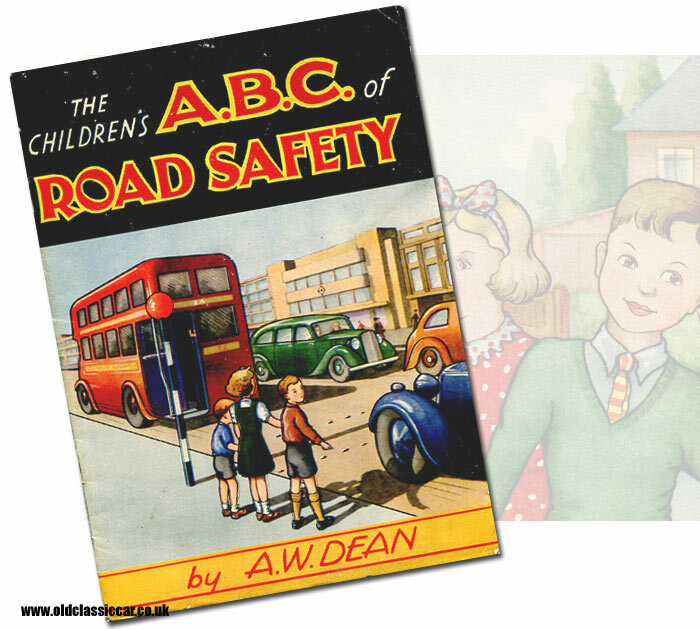 From before my time though is this full-colour publication, titled The Children's ABC of Road Safety. Written by A.W. Dean, and published for the Punchbowl Press by Septimus Ward Ltd of Preston, it isn't dated but hails from the 1930s or 1940s. Interestingly, it is dedicated to "Tony and Michael and children everywhere". I read once that the book was inspired by two children who were hurt, possibly fatally, in road accidents, but I've yet to be able to confirm this. The cover has a charming illustration of a typical road scene, where young children attempt to cross a road busy with traffic. They're using a Belisha Beacon crossing for the purpose, so-named as it was Minister of Transport Leslie Hore-Belisha that instigated their introduction to British roads, in 1934 (the Belisha card game, also from the 1930s, can be found here). The crossings were originally marked on the road by a series of metal studs, as can be seen below. Black and white stripes would be added later, from 1949, creating what would thereafter be known as "zebra crossings". As the book's title suggests, for each letter of the alphabet, a message regarding road safety is described accompanied by illustrations similar to that on the cover. "D" for instance is for Doggie - "whatever the breed, a danger to traffic, when not on his lead". "J" refers to the Jaywalker - "whose thoughts are afar, when they should really be, on that on-coming car." "M" is the Maxim, "for safety at night, if you'd "see and be seen", then cross near a light". "N" is "for the narrow lane, where bends make danger double, so walk well to the right-hand side, and you'll avoid all trouble". "O" is for old folks, "we meet every day, always so grateful, for help o'er the way". 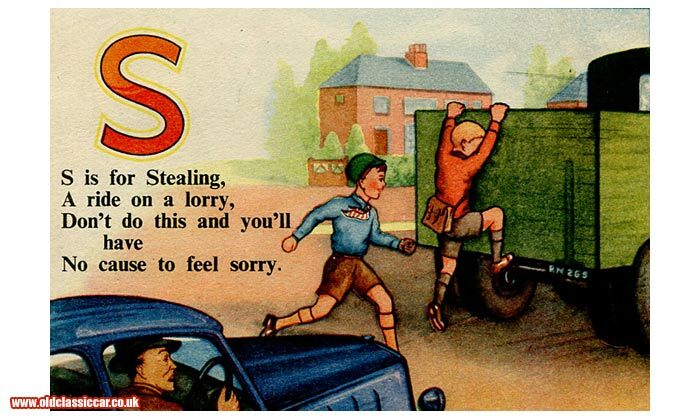 "S" is for stealing, however not the pilfering type but instead stealing a ride on the back of a passing lorry. It wasn't uncommon for adventuresome youths to jump up and hang onto the back of a lorry, car or a bus as it was driving along, for fun and frolics, but it wasn't the type of behaviour that a grown-up would likely encourage. The young tearaway in the following illustration would certainly get a shock if that tailgate hadn't been properly latched, or if the driver suddently decided to stamp his size 12 boot on the brake pedal. More period items relating to old vehicles can be found in the Motoring Collectables section of oldclassiccar.co.uk. A similar publication to this one, also on road safety but published by the OXO food company, can be found here. Interestingly in 1946 there was a public information film created titled "As Easy As ABC", aimed at children using techniques similar to those in this book (you can find the film on this external link). The film probably isn't directly related to this book, but it's a neat little production nonetheless.